This hotel is located in the bay of Cala Blava, in the most privileged area of Palma, and is discreetly integrated into its environment. 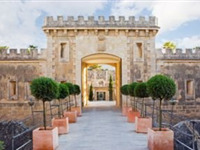 It is only 20 minutes from the city centre and 15 km from Palma Airport.This 24-room club resort is housed in an old military fortress and was restored in 2010 in keeping with its rich heritage and natural surroundings (marine and bird reserves). The old buildings of the fort have been transformed into seating areas where different settings have been recreated with private rooms for exclusive use by the hotel's guests. In the summer the patios are converted into makeshift rooms for enjoying the night. In addition to a reception area with 24-hour reception and check-out services, facilities available to guests include a hotel safe, currency exchange and a cloakroom, as well as a café, bar and a restaurant. Guests can also take advantage of conference facilities and WLAN Internet access.